You may have heard about Bid4Papers a lot. In this Bid4Papers review, I'm going to share my experience as well as answer the question many students ask, "Is Bid4Papers reliable and safe?" 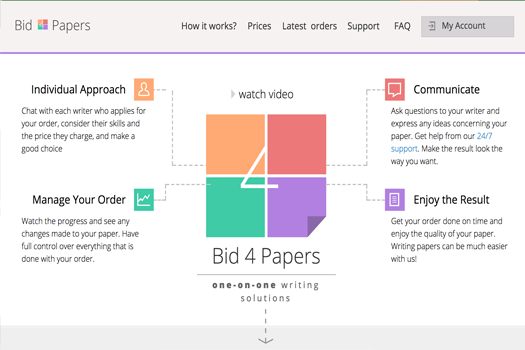 The design of Bid4Papers is great and makes a perfect job at showcasing their features. You can choose to watch their video which illustrates what they have to offer, or you can simply read the home page and you'll already have an idea about them. According to Bid 4 Papers, there's only four steps a client has to do in order to receive his paper. Fill in the order details, go through the order bidding, choose a writer & reserve money, and wait for the work process. Simple and effective. Bid4Paper received an average rating in my analysis of top sites with a bidding system. Compared to other companies of this kind, Bid4Papers is much worse in terms of price, revision policy and money back guarantee. I decided to try their service which I found over at OmniPapers.com. I later found out that Bid4Papers owns that site so I wasn't surprised to see them promoting themselves. Even more I was upset when I found out that Bid4Papers.com, EssayShark.com and CustomWritings.com are the same company, named ONE Freelance Limited (I strongly recommend you read my blog article on this case). The point is, before knowing they actually own OmniPapers I trusted them and it didn't really work out for me. It turned out that I chose a writer who could not meet my needs. One thing I did like is the bidding system which worked flawlessly. That's the only good thing I can say about Bid4Papers.com's service. In my case, it definitely wasn't worth the money I paid. The prices are high and they use a bidding system which is always welcome. The price depends on how urgent and what type of paper it is. Unfortunately, no discounts and promo codes available. The quality of the first paper draft I received was subpar, and some sentences didn't make sense. My writer once confused "your" with "you're a lot" and sometimes forgot punctuation marks. The structure of the text was also very weirdly done, as some sentences wouldn't make sense and not even be on the same subject as the previous one. Sure thing, I asked for revisions but it didnt help much. It wasn't the worst I've seen, but it can definitely be better. In short, my mistake is that I chose a writer with a low bid. I think, at a high price, I wouldn't get such problems. Still, there are many good reviews about Bid4Papers. The payment system is clean and easy to use. You submit instructions, select a writer, reserve money and watch your paper being written. You can use PayPal or credit card and the price depends on the writer's bid. Even though you can be satisfied with the quality of your paper (for the most part), there's a chance that the writer missed something. In case he missed the entire point – be it the date when you were supposed to get the paper or the quality, you're entitled to call upon the "money back policy". One of the best things about the money back guarantee is that you won't have to pay up front. You could pay the writer as the paper's getting closer to being finished, or at the very end. You can expect a full refund in cases of order cancelation, while you can only hope of getting the difference between the payed and promised when you "Release" the writer (by using the "release button). Pretty plain, and honest above all. Quality. My writer could not understand the subject properly. This is what made the experience mediocre. Twin sites. The fact that there are a few other sites just like this one is also a con for me, since it looks like a scam, even if it might be legit. Price. The prices aren't one of the lowest on the market, so if you're looking for an expensive, definitely not perfect paper, then Bid4Papers.com might be your place. I like bid sites, but the fact that it's not guaranteed at Bid4Papers to get a good writer makes the experience risky and unpleasant. I can recommend Bid4Papers only if you are going to choose the highest bids. You should have to be lucky to get a decent quality paper. 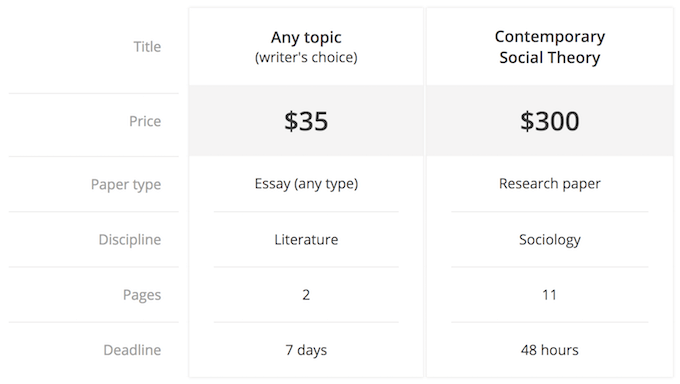 There are a lot of really good writing services among other essay bidding companies I tried. EssayPro is among them.